Getting to the southernmost continent in the world is not easy but that’s not to say it must be a combination of tiring and long travel days. 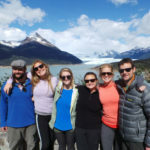 Below we share a Knowmad traveler’s trip to Antarctica by way of Argentina, with adventurous, relaxing, and fun days spent in Buenos Aires, Ushuaia, and Tierra del Fuego National Park, all before they embarked on their once-in-a-lifetime Antarctica expedition. We LOVED every part of the trip. Antarctica was such an amazing experience. What a privilege to see such beautiful animals in their own habitat. And the abundance of wildlife was incredible. I think my greatest surprise was how ice and snow and water can be among the most beautiful things I have ever seen. Every day was a feast for the eyes. Mother nature is the best artist. My greatest pleasure was the penguins. It was so special to see them up close, to see how they walk and swim and dive. We got a little video from on the ship looking down at one swimming then taking a little leap out of the water. How many people on earth have witnessed such a special scene? WE HAVE!! The seals and whales were pretty special too. We definitely recommend some time in Buenos Aires – a great city and enjoyed our stay, our tour, our guide, the drivers, and the experience. The hotel was a good choice in terms of location and ambiance. We enjoyed Ushuaia too, but maybe a little less time there would be better for us. We had a great tour of the National Park and again, our guide was excellent. We enjoyed the maritime/prison museum too. Because of all of the big cruise ships stopping there, it is getting to be a touristy spot – lots of T Shirt shops and trinkets. We are sending several photos and you can just select what you want to use . 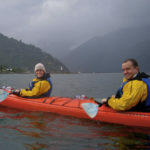 . . a couple from the National Park, some of our kayaking in Antarctica (hard to pick because they show the incredible beauty around us – we will let you choose), one camping, one on a boat in Ushuaia (with lighthouse), and one on the ship in Antarctica. I assume you already have lots of penguins and seals. Thanks again for making our trip so enjoyable. . . .great work! Do you want to take an Antarctica cruise from South America? We’re regional experts here at Knowmad Adventures and pride ourselves in building custom trips that are a perfect fit for our travelers. If you’re interested in crafting an adventure combining several regions in South America with Antarctica, but this particular itinerary doesn’t strike your fancy, don’t hesitate to reach out to our Trip Specialists at 612-394-2894 or travel@knowmadadventures.com to begin planning your trip today! You will take an overnight flight from the U.S., arriving in Buenos Aires the following morning. Upon your early morning arrival, you will be met at the airport by a Knowmad Adventures guide and transferred to your accommodations. (Please note that as you will likely arrive from your flight before standard check-in time, your room may not be ready immediately upon arrival. All common spaces will be fully available for your use in the meantime, and we also recommend storing your luggage with the hotel concierge as you explore the city and grab a bite to eat. You will be in the heart of the Palermo neighborhood, a neighborhood with many delicious restaurants and culturally rich sights to explore.) Enjoy the rest of the afternoon at your leisure independently enjoying the sights and sounds of the city. In the morning you will be met at 9:00 am at your accommodations by a Knowmad Adventures guide and taken on a guided half-day exploration of Buenos Aires, seeing the most important sights and centerpieces of this wonderful city. Dive into its culturally rich neighborhoods: San Telmo, La Boca, and La Recoleta. The adventure highlights many aspects of the city: the historic development, the immigration process, specific cultural topics (soccer, tango music), its architectural heritage, Peronism, and other interesting features of Argentine society. Included in this exploration will be a visit and guided walk through Teatro Colón, an iconic site in Buenos Aires that is consistently rated one of the best Opera houses in the world. Soak in the unique architecture, beautiful plazas, and colorful culture of this famed city. At the end of your excursion you can choose to continue exploring the city independently or be dropped off at your accommodations to enjoy the rest of the day at your leisure. Enjoy the day independently exploring the sights of the wonderful city of Buenos Aires. 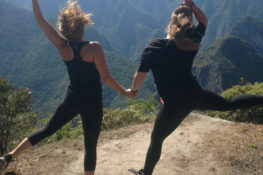 Highlights that you could explore include: Plaza de Mayo, the Cathedral, Art Nouveau and French architecture, antique markets, South America’s broadest Avenue, the Obelisco, soccer games, tango shows, and the opulent cemetery of Eva Perón’s resting place. You could also visit the Sunday market of San Telmo, an amazing street fair with hundreds of stalls, live entertainment, food, and more. After a morning at leisure, you will be met at 1:00 pm at your accommodations and transferred to the airport in accordance with your onward flight to Ushuaia (Spanish-speaking driver only). The hotel front desk can store your luggage after room checkout time as you continue exploring the city during the day. Upon arrival at Ushuaia, you will be met at the airport by a Knowmad Adventures guide and transferred to your accommodations. Spend the rest of the day independently exploring Argentina’s southernmost city or relaxing at your leisure at your accommodations. Enjoy the day at your leisure to experience the activities and natural beauty that Ushuaia has to offer. On your day of independent exploration of the natural and historic sites of the city. The Maritime Museum, housed in a former prison, gives fascinating insight into both the maritime history as well as a deeper understanding of life in the penal colony of the original settlers. For a panoramic view of the city, you could also choose to hike Cerro Castor or the Martial Glacier. Walking along the harbor, you can also find a number of companies offering Beagle Channel excursions, yet another idea for your independent day of exploration in the city. Meet your guide at 9:00 am in the hotel lobby to journey to the ‘End of the Earth’ on a full-day excursion through the most southern National Park in the world. Walk through the dense green forest, along the shore of the Beagle Channel, and by the Lapataia and Ensenada bays. Experience the unique and impressive landscapes of Tierra del Fuego by vehicle and also on foot, hiking on easy to moderate trails with the insight and support of an expert guide. Take in the tranquility that this incredible nature conveys during this unforgettable excursion. Please have your luggage packed, tagged, and ready in your hotel lobby at 9:30 am so that it can be transferred to your ship to be loaded onboard. At 3:30 pm, you will be met at your accommodations and transferred to the dock in accordance with your Antarctica cruise from South America (Spanish-speaking driver only). Before your pick up time please check out of your room by the hotel’s standard check out time; after checking out you could enjoy a final lunch before your cruise departs (to be paid direct). Your voyage begins where the world drops off: Ushuaia, Argentina, reputed to be the southernmost city on the planet, located on the far southern tip of South America. Starting in the afternoon, you embark and sail the scenic, mountain-fringed Beagle Channel for the rest of the evening. Gray stone peaks sketched with snow, towers of broken blue-white ice, and dramatically different wildlife below and above. You first pass the snow-capped Melchior Islands and Schollaert Channel, sailing between Brabant and Anvers Islands. Sites you may visit include: Cuverville Island – Stabbing up between Rongé Island and the Antarctic Peninsula, Cuverville houses a massive colony of gentoo penguins as well as pairs of breeding brown skuas. Danco Island – Activities here may focus on the gentoo penguins nesting on the island, in addition to the Weddell and crabeater seals that can be found nearby. Neko Harbour – An epic landscape of mammoth glaciers and endless wind-carved snow. Opportunities for Zodiac cruising and kayaking provide you the closest possible view of the ice-crusted alpine peaks. Paradise Bay – You may be able to take a Zodiac cruise in these sprawling, ice-flecked waters, where you have a good chance of seeing humpback and minke whales. Port Lockroy – After sailing through the Neumayer Channel, you get a chance to visit the former British research station – now a museum and post office – of Port Lockroy on Goudier Island. You may also be able to partake in activities around Jougla Point, meeting gentoo penguins and blue-eyed shags. There are great opportunities for kayaking and camping here. Pléneau & Petermann Islands – If the ice allows it, you may sail through the Lemaire Channel in search of Adélie penguins and blue-eyed shags. There’s also a good chance you’ll encounter humpback and minke whales here, as well as leopard seals. Wilhelmina Bay & Guvernøren – This is a great place to spot humpback whales. You also may embark on a Zodiac cruise ending at the ghostly wreck of the Guvernøren, a whaling vessel that caught fire here in 1915. Around the Melchior Islands, amid a frozen landscape peopled with icebergs, you may encounter even more whales, leopard seals, and crabeater seals. Conditions on the Drake Passage determine the exact time of departure. Today you will disembark from your cruise and be transferred to the airport in accordance with your onward flight to Buenos Aires (shared-guest transfer provided by Oceanwide). Upon arrival in Buenos Aires you will be met by your Knowmad Adventures guide and transferred to your accommodations to spend the rest of the evening at your leisure. Enjoy one more day at your leisure to explore, shop, eat, and enjoy Buenos Aires. Before your pick up time please check out of your room and have your bags packed and stored with the hotel front desk, as you will be transferred to the airport after room checkout time. At 6:20 pm, you’ll be met at your accommodations by a Spanish-speaking driver and transferred to the airport in accordance with your overnight, international flight home. If you’re interested in an Antarctica cruise from South America, don’t hesitate to reach out to our Trip Specialists at 612-394-2894 or travel@knowmadadventures.com to begin planning your custom South America and Antarctica trip today!